Welcome to our new look AIBCnews and our refreshed logo and branding. With IA-CEPA gathering momentum, even before the Agreement passes our respective parliaments, there is already a satisfying increase in activity and interest in the opportunities that are emerging. AIBC is excited to be part of this, and our updated look is timed to propel us into what will be a busy year ahead. Our thanks to Dave Elliot at Fuel Creative, and Airan Pevcic and Melinda Samways the creative team at Imagesource, for bringing life to our new branding. 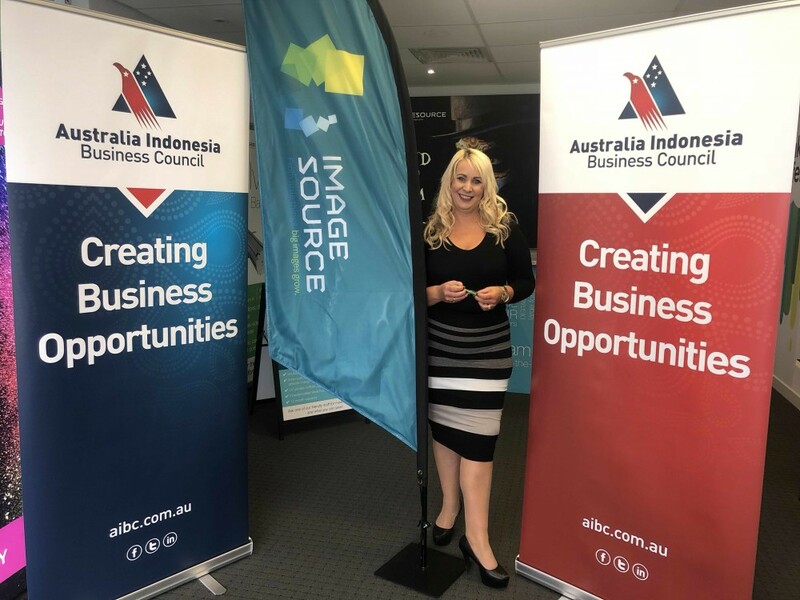 Imagesource’s Melinda Samways with our new AIBC banners ready for upcoming events around the country. As you’ll see from the rest of our newsletter, a lot has been happening, and much more is yet to come. In this past month I was delighted to be part of the Indonesia Study Tour hosted by Telstra and Telkomtelstra for Telstra Global Partners (full details below), as well as the roadshow conducted by Bahar and Pinsent Masons focusing on IA-CEPA. On IA-CEPA itself, the Agreement was tabled with the Australian Senate on the 20th of March, as another important step forward towards its ratification. Also, this month AIBC appointed Australia Awards Alumnus, Yudistira Adipratama, as an AIBC Ambassador, and we look forward to developing this role and to Yudistira’s ongoing contribution. To continue reading the March edition of AIBCnews, please click here.